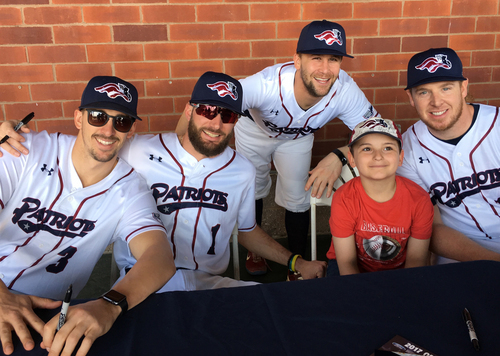 Bridgewater, NJ – The Somerset Patriots officially kicked off the 2019 pre-season with the team’s annual Fan Fest on Saturday, April 13th. Thousands converged at TD Bank Ballpark to enjoy the various festivities throughout the free event designed to get fans excited for the start of the upcoming season, beginning on Friday, April 26th at home. The perfect weather provided a beautiful setting for a 19th Century style Base Ball game on the field between the Flemington Neshanock and the Elizabeth Resolutes. Dozens of Somerset Patriots partners set up throughout the property to interact with fans, offer opportunities to win prizes, take home giveaways, benefit from special offers, sample products, and learn about the different participating businesses and organizations. Young fans and kids at heart were entertained by Patriots Mascot Sparkee and his pal Slider. Melzo The Clown worked her magic and provided face painting for children all event long. At the conclusion of the vintage baseball game, all the kids in attendance were able to run the bases.